The New Order is the lifeblood of EVE today. People ask, "Where are the new players? Where's the next generation of elite PvP'ers?" I direct them to the New Order. We are turning out elite PvP'ers--almost more than we know what to do with. Sitting by himself in the ice anomaly of Kiskoken one day: The inauspiciously named Minin' Mike of the inauspiciously named ISK.Space corporation. This frightful scene attracted the attention of Agent Duvaindes Fireleaf, who put Mike's Covetor to the torch. It was a routine operation with the expected result, a tremendous CODE. victory. But when Mike was asked to buy a permit, something strange occurred. The destruction of the miner's ship had left him adrift in a sea of confusion. He cried out in local for the only thing he could think of. Duvaindes followed standard protocol. It was ineffective, not having been designed with this particular breed of carebear in mind. 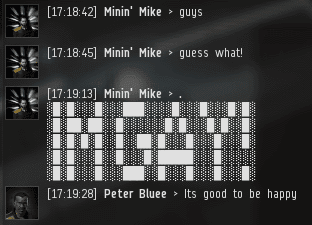 Witnessing this sorry spectacle, the Kiskoken community did not rally around Minin' Mike. They were too busy nursing their own grudges against CODE. 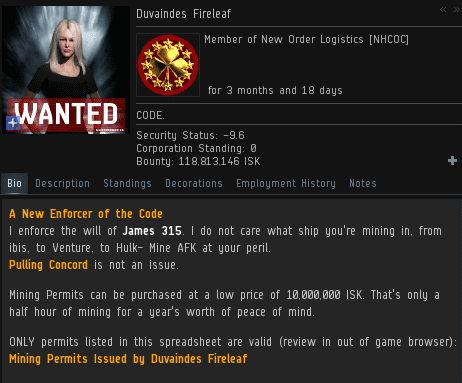 Our Agent tried to help the miner snap out of it. But Mike's mind--what was left of it--could not be pried from its single-minded obsession. 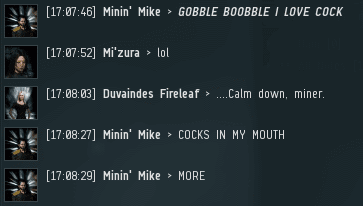 Duvaindes quickly realized that Mike's psyche had been left in shambles, the result of far too many AFK mining ops in the ice anomalies of highsec. Only a few months into her career as a Code enforcer, Duvaindes had come across one of the severest cases of bot-aspirancy ever encountered. There was little guidance to be found in the New Order literature. She could only hope that the next time Mike was ganked, a more experienced Agent would have better luck with him. 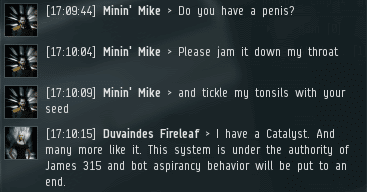 Minin' Mike was truly a cautionary tale. Carebears, don't let this happen to you, too. 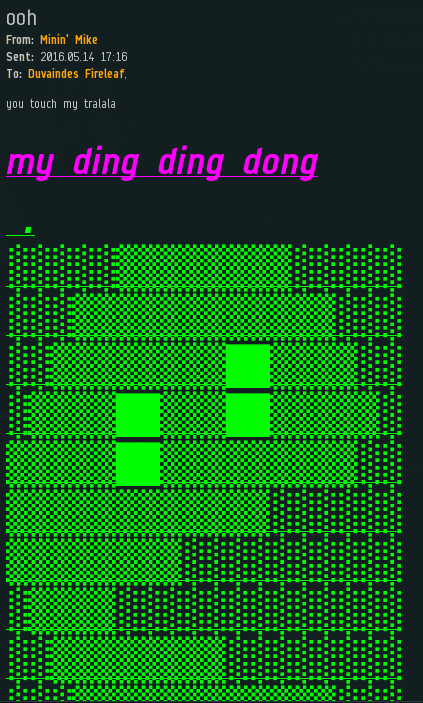 You think it won't, but that's probably what Mike thought when he first began to mine. Better to stick with the Code instead, don't you agree? This is so funny – and tragic! Are you trying to sell me perfume is both an obscure reference, and a classic. Unlike AG, which is both failing nonstop daily, and not funny. Because of all the failing. That perfume reference was brilliant! 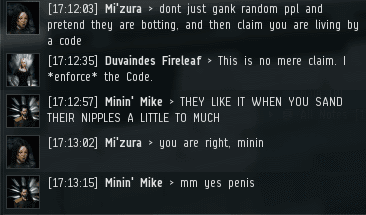 Whats up with Antigankers and male genitalia? It fits in their mouth? They are envious of those who have it. I think your agents were too late to save this one James. Smells like the ending of Old Yeller. A tale for the grandchildren for sure! 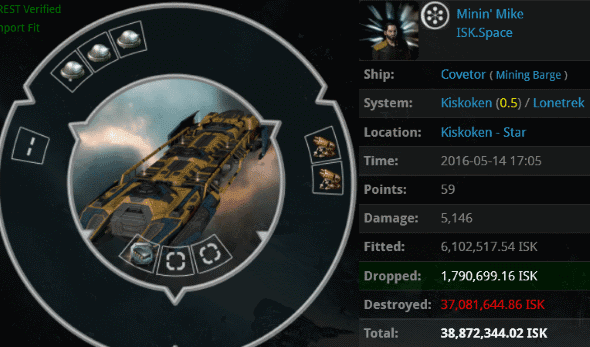 Ming is still docked up and crying that I scammed him out of isk. I have to wonder if the miner in question was a NO agent posing as a miner to 'generate content' for the blog. Nah, that requires thinking, something which NO agents have been proven incapable of.